Wasps director of rugby Dai Young says Wales' policy of selecting Test players based outside the country has "wrecked" regional rugby. Former Wales captain Young backed England's position of refusing to pick players once they have moved abroad. He was commenting on the day Australia announced they were relaxing their selection policy on overseas players. "I've seen it from Wales, and it's done much more harm than good. England's stance is by far the best," he said. "I've come through that system in Wales, and it certainly wrecked and put regional rugby under a hell of a lot of pressure," he told BBC Radio 5 live. Wales has seen more than a dozen top-flight players leaving the regions to play for clubs in France and England, including Leigh Halfpenny,Jamie Roberts,Richard Hibbard and Jonathan Davies. The Welsh Rugby Union introduced the so-called "Gatland's Law" which favours Wales-based players for international selection as part of their latest financial deal with the four regions in 2014. However, five of head coach Warren Gatland's team that started the last match of the 2015 Six Nations against Italy were based in either France or England. WRU chief executive Roger Lewis says that policy allows Gatland flexibility when it comes to selecting players based outside Wales for Tests. "That's the card that Warren has got in his back pocket," said Lewis. "If he can come up with an appropriate argument for picking appropriate players at the appropriate time, then so be it. And we'd all support that." By contrast, Toulon's impressive back-row Steffon Armitage was not considered for selection by England coach Stuart Lancaster. Young says the detrimental impact on the domestic game of losing the big stars has been obvious in Wales. 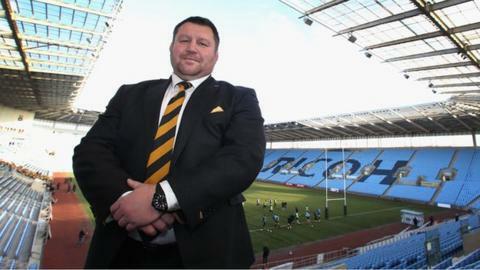 "You see falling crowds, everybody wants to see their top stars," added Young, who was director of rugby at Cardiff Blues before joining Wasps in 2011. "The games aren't as attractive with your top stars not playing. "You lose control over your players as well, as in their fitness, their condition and their welfare and so on. "To me England's stance is absolutely right and they should stick to it, otherwise you will see the quality of the Premiership dwindle." England and New Zealand are now the only major nations whose rules ensure only home-based players can play Test rugby. Young says that policy is the correct one, because it discourages players from leaving to play abroad. "I don't think many of those Welsh players - knowing them as I did because I coached quite a few of them - they wouldn't have left Wales if they knew they were leaving their international career behind," he said. "There are lessons to be learnt from that, and certainly I would back England's stance 100%."